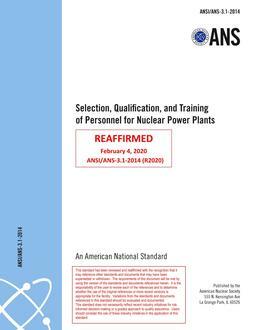 This standard provides criteria for the selection, qualification, and training of personnel for nuclear power plants. The qualifications of personnel in the operating organizations appropriate to safe and efficient operation of a nuclear power plant are addressed in terms of the minimum education, experience, and training requirements. Requirements of this standard do not apply to test, mobile, training, and research reactors. The purpose of this standard is to provide guidance for functional levels and job positions as they exist in the operating organization. Each owner organization defines its organizational structure, responsibilities of groups, and responsibilities of individuals within the operating organization. Qualification requirements include eduction, experience, and training. This standard provides qualification guidance to meet the particular organizational needs that are derived from the requirements contained in this standard. This standard requires a training development process based on the performance requirements of the job, and, as such, does not prescribe specific training program content. This standard is not intended to prescribe specific job titles or responsibilities of organizational postions. The education and experience requirements hould be applied to the function and may not directly match the titles listed in this standard.